I'm not a huge fan of animal print because they can be too busy. 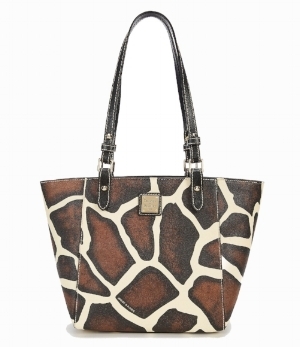 The large giraffe print of this bag, however, I find quite classy. I have a solid print bag in the same style and I like the spaciousness. I can hold my laptop files wallet and a few other items comfortably. It's a good Workhorse of a work bag. I started wearing a flower in my hair in August. I needed a way to spice up my 'fro and found that when I wore a flower in my hair people smiled at me. If you don't know, I love happy people! My 'fro is on hiatus, but will return in January 2018. I am a HUGE fan of yoga pants. Part of my TGIF ritual is taking a shower and slipping into some comfortable loungewear. Not all comfy cloths are created equal. The more they conform to my body and hold up in the wash, the more I love them. I especially like Anybody Loungewear because of the comfort and fit (the come in petite for us short gals). Argan oil has gained popularity in recent years. Known for its skin softening and hydrating properties, it's not uncommon to find shelves full of products containing this prized emollient My favorite argan-laced products are made by Josie Maran. I find her whips and butters to be light and airy, and they easily absorb into the skin. This cold weather has forced us to crank up the heat in my house. With artificially heated air comes dry skin. With dry skin comes a wrinkled face. Fortunately, I have been blessed enough to still be alive and well. Unfortunately, I'm at an age where I'm paying attention to my skin and its care.